New York's Nanuet Patch reports that local Girl Scouts recently compete in the second annual Project Girl Scouts Design Competition at the Palisades Center. One prize-winning dress for each of the four seasons was unveiled at the Palisades Center in West Nyack on May 18 as the culmination of the Center’s second annual “Project Girl Scouts “design competition conducted in partnership with Girl Scouts Heart of the Hudson, Inc.
Members of 14 area Girl Scout troops were challenged to design a dress using materials from “tool kits” provided by the Palisades Center. 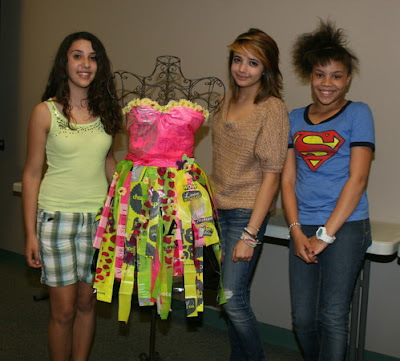 The 2012 kits were filled with design elements geared to spark the girls’ imaginations as they created their team’s season-themed dress. Ninety percent of each creation was fabricated from shopping bags provided by Palisades Center vendors. The winter dress was designed by Congers troop 40266 while spring was the inspiration for troop 40018 from Pearl River. The breezy summer winner was the product of troop 40275 of Congers and the fall selection was created by girls from troops in West Nyack and New City —troops 40636 and 40434. The colorful designs each incorporated icons of their particular season, such as seashells, daisies, and snowflakes. The dresses were judged by marketing professionals from the Palisades Center along with members of Girl Scout Senior troop 40139 of New City. The dress designers were interviewed about their design choices and techniques, and the creations garnering the most points were chosen for display through June 5 in the Palisades Center’s first-floor customer service area.